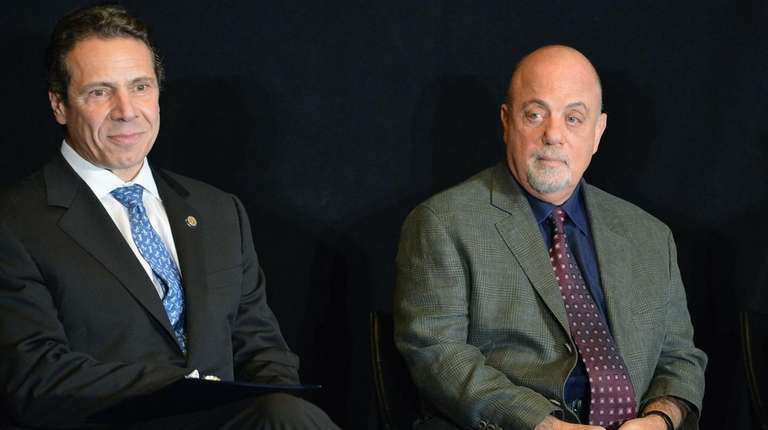 Billy Joel and Gov. Andrew Cuomo talk about their shared love of pasta, boating and “feeling anonymous” in a new interview with Beach magazine. Cuomo jokes that he is interviewing the Hicksville native in his “official capacity” as governor, while also revealing that Joel has cooked dinner for him and that he is the godfather of Joel’s daughter, Della Rose, who turns 1 in August. “Is it a coincidence that you named an Italian godfather or do you think it was necessary to actually fulfill the role with an Italian?” Cuomo asked Joel, laughing. Joel will play Madison Square Garden on Friday as part of his ongoing residency at the arena, having wrapped a string of stadium shows on the West Coast last week. His tour of East Coast and Midwestern stadiums starts July 1 in Pittsburgh and will include shows at Boston’s Fenway Park and Chicago’s Wrigley Field.